Bedford Blues captain Nick Fenton-Wells was proud with his side’s execution on Saturday during the 38-8 victory over Plymouth Albion. Tries from Phil Boulton, Steffan Jones, Paul Tupai and two from Michael Le Bourgeois were enough to secure a comfortable bonus point victory that sees the Blues climb back into the top half of the table. Speaking after the match at Goldington Road, Fenton-Wells said: “I’m really proud of the guys for focusing on what we had to do and executing it. Unlike recent weeks, Bedford were on the front foot from the first whistle and set the benchmark for how the rest of the afternoon was to be played. The South African back rower is hoping the team can continue like that in their forthcoming fixtures. “That was our focus this week, we really wanted to come out and be the side that started well,” he said. “We haven’t started well in a long time, that’s all we asked for and it worked. Hopefully we can take that into the next games and build momentum. The skipper added: “Bedford are known for moving the ball around as we know that’s what the people want to see. I think it’s important for us to focus on those first 10 minutes though. 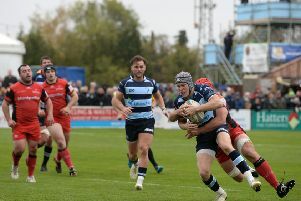 Saturday’s win was the former Saracens player’s first start in the Bedford Blue since the November 14 when he was injured in the home win over Yorkshire Carnegie, and he is delighted to be back.